I remember checking this out of the Thomas Jefferson branch of the Fairfax County library system NUMEROUS times. Proof positive that I was reading about food even when I was in grade school. This is a delightful story about an eleven-year-old girl who, bored one January day, discovers a county-wide cooking contest for girls her age (no boys allowed in the kitchen in those days, right?) is on that spring -- the prize is a trip to Washington, DC. Of course, this prize always gave me a chuckle, growing up near DC as I did. And Ginnie herself was only ten miles away from New York City. But I digress. The charm in the story lies in the friendships between Ginnie and her friends, her respect and care for the neighbors and little children, the kids' efforts to raise money for a community pool, and even the quirkiness of a pickle mine thrown in. A pickle mine? Yes, indeed.Add to this all the FOOD - what a wonderful little snapshot of the sort of cooking going on in the mid-60s: chicken loaf, gelatin salads with odd ingredients, and homemade bread so very unusual and special. Oh, I love this book. I never was much of a Ginnie fan, but this one makes me hungry for 1960s cuisine - chicken loaf, souffles, gelatin salads! Of course, home-baked bread is the real star here. It's thanks to this book (and the Ginnie cookbook) that I first tried my hand at bread-baking. I haven't made any in awhile, but maybe it's time to add yeast to my shopping list. This was a re-read of one of my favorite series as a young girl. This book was everything I remembered it to be, and it is fun and inspiring. Ginnie is an 11 year old only child who loves to cook, solve mysteries, help others and try new things. In this book, Ginnie decides to enter a cooking contest and tries many new recipes to find the perfect one. This is one of my favorite in the series, because it was all about cooking and specifically, baking bread. This book would be a great read aloud to any girl 6 and up and probably suitable for a 2nd-3rd grade reading level. These books are out of print and hard to find, but worth it! My kids were totally interested in this book--which was surprising because a third of it is a detailed account of this girl searching for, trying out and deciding on recipes. (They obviously have a mother who LOVES to cook). It was written in the 1950s and you could tell, which was fun. Not the most exciting book I've read, but the kids and I enjoyed it. As a girl, cooking and baking were two of my favorite things to do, along with reading. This book combined both my likes. I loved all the Ginnie books, I can still remember what shelf they were on in my local public library. I'm sad that they are out of print, and very hard to find. This book always makes me hungry, even though I don't like the sound of half of the recipes. But mmmm - warm homemade bread! 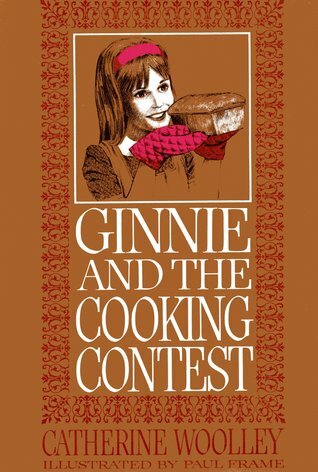 This is probably my favorite of the Ginnie books, and I always think about it when making bread (which used to be a more frequent occurrence). Here's another "Ginnie" book - again, extremely dated, but very, very sweet. A real comfort read. A whole book in which a girl tries out a bunch of different scrumptious dishes in hopes of winning a contest! Obviously I love it. Plus there is a secret pickle mine. I loved this book when I was growing up and I miss it even if it is a children's book!